The use of implants to replace missing teeth is safe, can provide a natural appearance and is very popular in the world of dentistry. Dental implants are made ​​of a biocompatible material, which is implanted into the gums or jawbone to replace missing teeth. 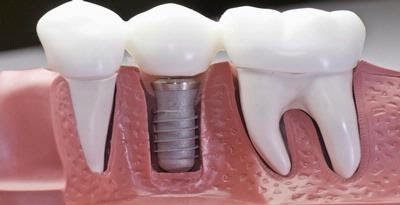 The success of dental implants depends on the level of proficiency Dentist who installed implants, jaw bone quality and quantity that would be the installation of implants, and oral health of patients. a. Systemic health conditions of patients. For example having Diabetes Mellitus, because the effect on tissue healing after implant placement action. However, if the disease Diabetes Mellitus uncontrolled, the success of an implant-would be achieved. b. Previous history of dental disease. c. Patient's motivation and ability to maintain oral health. Patients with poor oral conditions, are not able to maintain the cleanliness of his own mouth, and have a habit of smoking usually will fail if done dental implant. 3. Consideration conditions adjacent teeth, jaw bone and surrounding soft tissue as well as dental implants that will be installed. All information relating to the consideration of the installation of dental implants to be obtained through anamnesis, clinical examination, and radiographs (usually dental panoramic photo). d. Improving psychological and mental status. a. Bone damage does not exceed? vertical height of the prosthesis. b. Occlusal balance and vertical dimension which is good. c. Inflammation of the gums can be treated. d. Unsteadiness implant does not exceed 1 mm in all directions. e. The absence of infection or symptoms of infection. f. No damage to nearby teeth. g. Not occur paresthesias in the mandibular canal, maxillary sinus, nasal cavity or the base. 2. Implant movement is quite noticeable. 4. Progressive loss of supporting bone. 5. Anesthesia or paresthesias were unbearable. 6. Existence oraoantral or oronasal fistula. 8. Disorders or mental health is real. 9. Implant breakage is irreversible. 10. Damage to nearby teeth that are irreversible. 11. Existence of problems related to cosmetics. As for how to maintain a dental implant is to maintain your oral health by brushing your teeth with the right technique and frequency (do not try any leftovers left and attached to the implant and your teeth), using chlorhexidine as an antibacterial mouthwash, using threads as an additional gear teeth cleaning, do not do bad habits such as smoking, and also do regular checks to the Dentist is done 3-4 times a year for cleaning plaque or tartar. You can consult further to the Dentist is certified to perform dental implant. Ask her everything you feel is less clear. Thus Mrs. Ninin, hopefully useful information.